Last night looters sneaked into the southern quarry of the upper Egyptian city of Aswan in an attempt to cut and remove the statue of King Ramses II. The statue is half buried in the sand as it was originally cut in red granite and left in situ. Following an immediate report from the quarry’s security guards, archaeologists along with security personal headed directly to the site where they caught the thieves red handed. Zahi Hawass, minister of state for antiquities affairs, described the statue as beautifully carved although it does not bear any engravings. The statue is six meters high, 175 centimeters in width and eight centimeters thick. It depicts king Ramses II in the shape of the god Osiris. 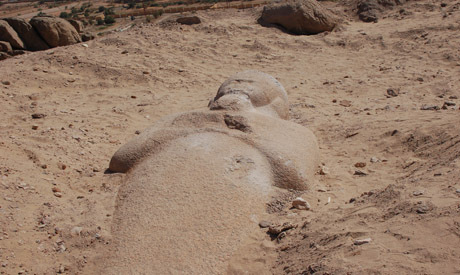 Mohamed El-Beyali, director general of Aswan and Nubia antiquities, told Ahram Online that the statue is in a very well preserved condition and is one of the quarry’s landmarks. He added that it remains unknown why ancient Egyptians carved the statue and left it in the quarry. The site also includes several unfinished artefacts, which explains the quarrying and sculpting system used by ancient Egyptians at the time. Other unfinished statues and huge basins from the Graeco Roman era are also located there. The quarry was used by ancient Egyptian to cut granite blocks and for the constructions of temples and carving colossi. A project to develop the site and make it more tourist friendly is under execution in order to open it to visitors.